The Madison Mission Trestle Table is Amish handcrafted in Indiana. This Mission table is shown in a 42" x 72" with our beautiful boat shaped top. Choose to have this table handcrafted from oak wood, brown maple wood, rustic cherry wood, quarter sawn white oak wood, cherry wood or hickory wood as well as a wide variety of stain and paint options. Please call one of our Amish furniture specialists with questions or ordering assistance on our Mission furniture. 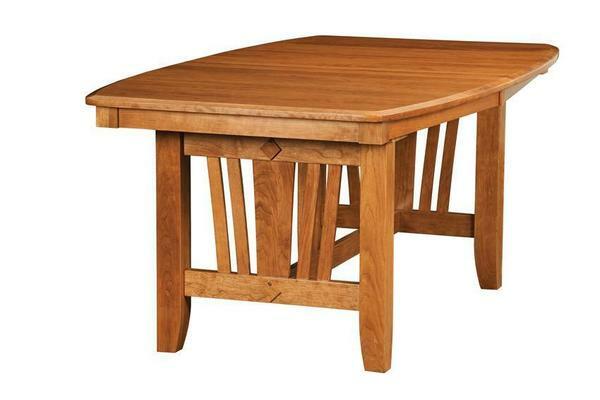 We offer a wide variety of Mission dining room furniture for your home or business.